Google has again updated its Gmail app for Android bringing some new features and fixing some bugs. 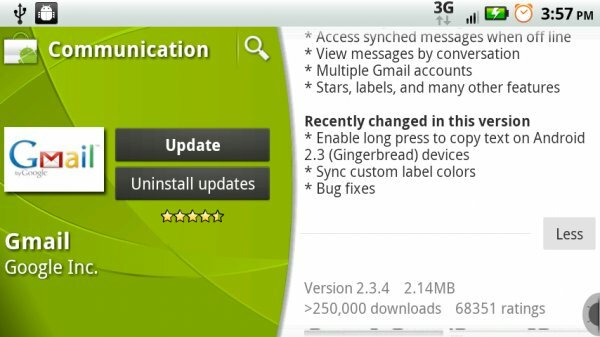 Users working with Android 2.3.x Gingerbread can now copy text in the Gmail app by long press and tap. Another noticeable update includes the ability to sync custom label colors. As always apart from new features, there are some unmentioned bug fixes. The ability to easily select the text is appealing but you won’t enjoy it unless you have Gingerbread update on your phone or you already have a phone that comes default with Gingerbread installed. You can update Gmail app for Android on your Android phone by going to Market app or you can install it via the Android Marketplace on the web.